Obtaining user feedback and incorporating it into the software development process isn't always an easy task. Fortunately for the companies that took part in the Product Development Success study, collecting feedback is one of the areas on which they perform the best. With an overall grade of 77 on the feedback sub-index, companies scored better on the feedback section than on any section other than collaboration. What are the activities that were measured to make up the feedback sub-index? Soliciting feedback on customer needs is the first, and its an area where most companies fare well. Overall, companies scored an 81 on the Customer Feedback metric, meaning they agreed with the statement, "Our company solicits feedback on customer needs." This solicitation can come in the form of surveys, user interviews, focus groups, or tracking usage metrics via analytics tools like Google Analytics or Omniture. 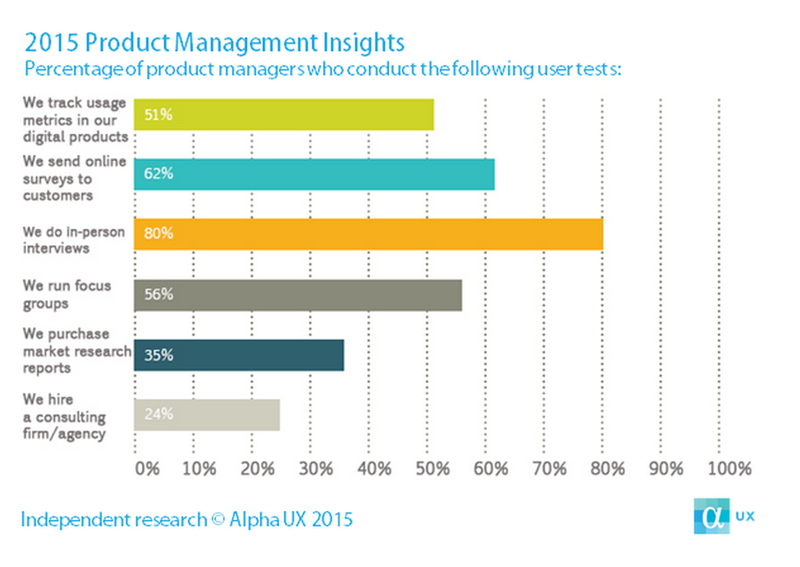 A recent study on Product Management Insights by Alpha UX breaks down the different ways product managers solicit user feedback. Another component of the feedback sub-index is testing. This is also an area in which companies fared relatively well, scoring a 77 by agreeing with the statement, "My company performs in-house testing of prototypes of new software products." Companies that test prototypes before moving on to full-fledged development work were shown to be more successful than counterparts that did not engage in any kind of prototyping or testing. The area of testing where companies fared worst was in incorporating the feedback they received into the development process. Overall, companies received a score of 74 on the statement, "User feedback is routinely incorporated into software product development at my company." While the discrepancy in numbers for these three statements isn't huge, it does show that knowing what to do with user feedback and how to incorporate it into something tangible isn't always clear to those in development functions. Will Sherlin is the Digital Marketing Manager at 3Pillar Global. In this role he has been responsible for overseeing a redesign of 3Pillar Global's corporate website and web properties. He writes content for the company blog, manages 3Pillar's social media presences on Twitter, LinkedIn, Facebook, and Google+, and hosts the company's weekly podcast called "The Innovation Engine."